“Gordon” is a cleverly-named project by Tobias Schneider which hopes to rectify the situation. It translates Flash SWF files to Scalable Vector Graphics which are supported on the iPhone. The project runs on most modern browsers with the exception of Internet Explorer (which doesn’t offer native SVG support … yet). Gordon currently supports the SWF 1.0 format and SWF 2.0 is in development. There are several demonstrations available and, although they’re simple, they work well and show the potential. 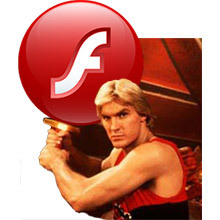 Of course, all this work might be in vain if the real Flash plugin appears on the iPhone. But that seems fairly unlikely — Steve Jobs has little regard for Flash and states that it runs too slowly on the device. It’s also a competitor to the standard iPhone/iPad applications platform. Have you tried Gordon? Could it ever be a viable alternative to the Flash plugin on unsupported browsers? Should Adobe hire the developer immediately? !